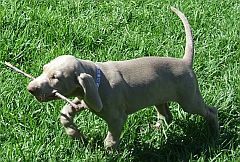 Weathervane Weimaraners is a small kennel based in beautiful Northern Kwa-Zulu Natal, South Africa. 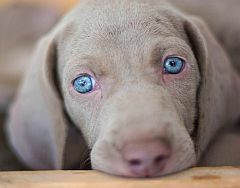 Having owned Weimaraners for a number of years, I am dedicated to improving the Weimaraner breed. I take great pride in breeding top quality dogs with excellent temperaments, a loyal and faithful companion who is happy to be with you, to be near you, and will want to please you. Weathervane Weimaraners welcomed our sire Lincoln, Rutilus Dear Mr President of Weathervane (imp UK) in 2013. Lincoln has an outstanding lineage, coming from a long line of CRUFTS winners, but more importantly, the most wonderful temperament. He is laid-back, loves other dogs and is a great favourite of children at the shows. He has done very well in the show ring, winning top puppy honours - BPIS at the Gundog Club and RBPIS at the Natal Gundog Club, going on to win over twenty CCs. 2014 saw Lincoln achieve championship status. 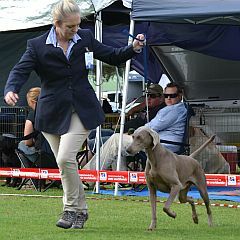 Hundwith Volante of Weathervane (imp UK) joined Weathervane Weimaraners at the end of 2013. Volante is enthusiastic with lots of personality. She is settling well and is continually improving as she matures. She won Best Minor Puppy and BPIS at the Weimaraner Klub Open Show, going on to win Best Junior in Show at the Weimaraner Klub Championship Show later in the year. Surprise of the 2014 season was Antebella Lady of Weathervane. Affectionately known as ‘Farm Dog’ she was shown on a whim, absolutely loved being in the limelight and picked up RBOB and then BOB and G3 from overseas judges, in a very short time achieving the required number of CCs to be a champion. 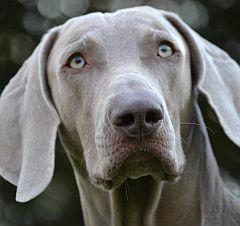 Weathervane Weimaraners are very proud of their dogs and their achievements. Showing is an opportunity to show off our superb lineage but at the end of the day the dogs are protective companions - happiest at home, in the veld, and close to their owner. Hundwith Volante (imp UK). Winner Best Puppy Weim Open 2014, Best Junior Weim Champ 2014, Best Graduate Weim Open 2015, multiple CC and BOB winner. Weathervane Weimaraners welcomed our sire Lincoln, Rutilus Dear Mr President of Weathervane (imp UK) in 2013. Lincoln has an outstanding lineage, coming from a long line of CRUFTS winners, but more importantly, the most wonderful temperament. He is laid-back, loves other dogs and people. He has done very well in the show ring in South Africa, winning many CCs, BOBs and BPIS at the Weimaraner and Gundog Shows. 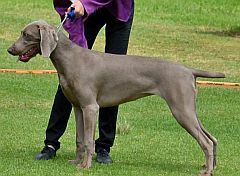 Hundwith Volante of Weathervane (imp UK) joined the other Weimaraners at Weathvane at the end of 2013. She is the perfect match for Lincoln and will start her show career in March 2014. We expect great things of Volante in the future. The 2 pix above are CH Rutilus Dear Mr President (imp UK). Winner RBPIS Natal Gundog, BPIS Gundog Club, BJIS Weim Champ Show, BOS Weim Champ Show, winner of over 20 CCs, BOB and Group winner. The name, "Weathervane," is registered with KUSA. Puppies are KUSA registered with breeding restrictions & contract. We microchip our pups before they go to their new homes.